Australia's Monster Fest launches crowdfund for DRAGON FORCE X! Cult of Monster, the official online arm of Monster Pictures, today marks its first ever creative collaboration with Melbourne based production company, Lost Art Films; the fantasy/action/adventure web-series, DRAGON FORCE X, with the release of its official teaser trailer, poster by Australian artist Noelle Criminova and the announcement of a crowd funding campaign. 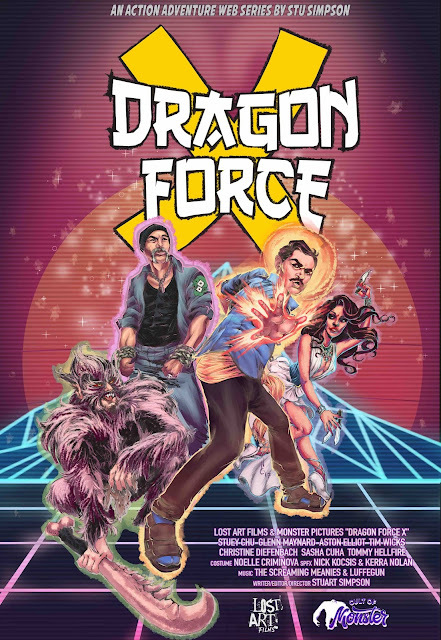 Written and directed by Lost Art Films founder Stuart Simpson and based on his award-winning Monster Fest 2016 'Best Short Film’, DRAGON FORCE X is an '80s inspired, adrenaline-fuelled, over-the-top, epic action fantasy that’ll remind genre fans across the planet of the potency and sheer power of Australia’s greatest gift to humanity… Ozploitation! “Stu has had a long association with Monster Pictures, but this is our first creative collaboration and we couldn’t be more psyched” said Monster Pictures Online Content Director Jarret Gahan, “DRAGON FORCE was the most talked about film at last year’s Monster Fest and the series DRAGON FORCE X acts as both a prequel and sequel of sorts. It’s bizarre, gratuitous, clever and thoroughly entertaining, we know folks are going to love it” he continued. DRAGON FORCE X has been in production for the last three months and with post-production underway, Monster Pictures and Lost Art Films are today turning to their legion of die-hard fans to get behind the web-series by supporting their crowd funding campaign via popular Australian crowd funding portal, Pozible. “Stu is a favourite of the Monster fan-base, for a bunch of years he’s thrown every bit of his heart and soul into some of the coolest shorts and features we’ve been associated with and now punters have a chance to support his endeavours from the ground floor. There’s a bunch of cool incentives that’ll get punters salivating, but really the greatest incentive of all will be to watch Stu’s latest baby come to life and to hit the air via the Cult of Monster website. Stu is a major talent and this is your chance to get behind him and be part of his crazy DRAGON FORCE X world, get on to it folks, and let the Force X be with you” Said campaign manager Ben Hellwig of Monster Pictures. The campaign launched officially on Friday August 25th, and will go into full swing the following day, Saturday the 26th, at the Melbourne Movie Market at the historic Astor Theatre. The Melbourne Movie Market will end with a kick-arse bout of movie trivia, with all proceeds helping to raise funds for the series. Following that will be the DRAGON FORCE X Official Crowd Funding Launch Party at the Reverence Hotel starting at 8pm the party will be a night of 80’s inspired synthwave, electro-pop, rock and metal madness featuring the sounds of local outfits Pretty City, Jules Sheldon, Pterodakktyl and Brisbane’s very own maestro of murder beats, Monster Fest favourite The Screaming Meanies.